Below you find enlargements of map sections  do click on these and enjoy the view! Africa is inhabited by different ethnic groups, each with a musical tradition of its own. This is a rich traditional music heritage that has been orally transmitted from generation to generation for centuries. Despite external influences, the majority of these ethnic groups continue to value and practise their respective traditional musical styles, which in turn have to establish strong musical and cultural identities and continue to do so. Ugandan music is generally rhythmic and the complexity of these rhythms varies due to the difference between the ethnic groups. These differences are also reflected in the varied instrumentation. Some musical genres are played on simple instruments, while others, especially the dance music, are played in ensembles of complex instrumental formation. African music is usually pentatonic, but a few tribes also use a hexatonic scale. Most of the Ugandan vocal music is accompanied by traditional instruments. The literature embedded in vocal music is purposely meant to transform the social communities, i.e. in their structural adjustment. Although Uganda is inhabited by a large variety of ethnic groups, a broad linguistic division is usually made between the Bantu-speaking majority, who lives in the central, southern and western parts of the country, and the non-Bantu speakers, who occupy the eastern, northern and north-western part of the country (these may be sub-divided into Nilotic and Central Sudanic peoples). The first category includes the large and historically highly centralized kingdom of Buganda, the smaller western Ugandan kingdoms of Bunyoro, Nkole (Ankole) and Toro (Batooro), and the Busoga states to the east of Buganda. There are four main ethnic groups in Uganda which all have different origins. By far the largest in number the Bantus have come from Central Africa from the Cameroon Highlands or Congo Basins, include the tribes of Baganda, Banyankore, Basoga, Bakiga, Batooro, Banyoro, Banyarwanda, Bagisu, Bagwere and Bakonzo. The peoples in the second category (they constitute less than one-tenth per cent of the population) include the Iteso, Langi, Acholi, Alur, Karimojong, Kakwa, Japadhola, Kumam, Sebei, Jonam (Nilotic language groups who comes from the north), the Nilo-Hamitics and the Metu, Madi, Lugbara, Lendu and Okebu (Central Sudanic group) in the northwest and a number of other smaller societies in the eastern part of the country. The republic of Uganda is an independent nation located in East Africa astride the equator, bordered on the east by Kenya, on the south by Tanzania and Rwanda, on the west by the Democratic Republic of the Congo (ex. Zaire), and on the north by Sudan. It covers an area of 241,040 sq. km. The population is approximately 28 million, of which 66 per cent are Christians, (the Anglican, the Catholics as well as the Pentecostal Church), 18 per cent practise traditional beliefs (most of whom worship in Jinja and Busia near the border with Kenya), and 16 per cent are Muslim. There were sizeable numbers of Sikhs and Hindus in the country.The official language is English, and the capital is Kampala. The country has many lakes and swamps. The relief and the water in many lakes and rivers give a pleasant temperature throughout the year. Uganda is a unique country with a mild climate, evergreen natural vegetation, with soil fertility being secure throughout the year. Uganda's climate generally varies from 30° C during the day to as low as 13° C at night. In the hot months, from December to February, temperatures vary from 31° C to 35° C. Northern Uganda has a rainy season from April to October and a dry season from November to March. The south has two rainy seasons: the first in April and May; the second one in October and November. Lake Victoria and Lake Kyoga flow into the River Nile. 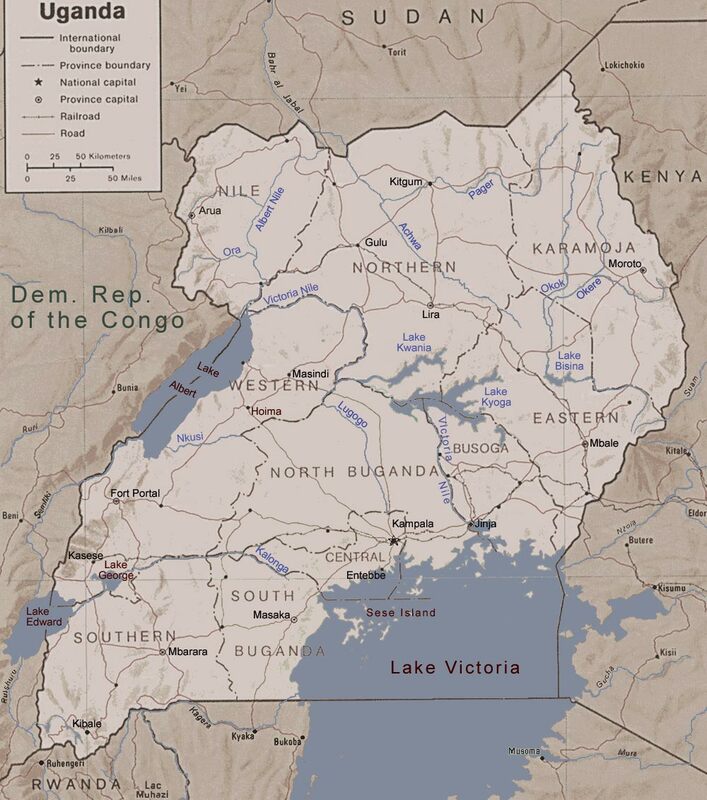 Lake Edward and Lake Albert are situated on the border to Congo. A large part of Uganda is flat, and there are volcanic mountains. The biggest is the Rwenzori mountain range at the border to the Congo with the highest point being the Margherita Peak on Mount Stanley 5'110 m. The Mount Elgon range is situated at the border to Kenya with 4'321 m. The southwestern part of Uganda, is also mountainous. The rest of the country is constitutes of grassland and forests. In the northeast, there is the semi-desert. There is to be found a large variety of wildlife in the Kabalega National Park in the northwest and the Lake Mburo National Park in the south. As examples therefore are given hippos, crocodiles, gazelles, impalas, spotted hyenas, leopards, buffalos, gorillas and chimpanzees. Also a wide array of birds like white-crested hornbills, long-tailed hawks, gray parrots, pygmy falcons, and stone partridges may be encountered. The economy, in general, is agricultural, with matooke (cookbanana), cassava, sweet potatoes, millet and sorghum. Further there is produced coffee (which provides over 90 per cent of export), cotton, tea, and tobacco. Stockraising, fishing and hardwood production constitute another economic items. Uganda's natural resources are cobalt, copper, salt, and limestone. Uganda's long string of tragedies since independence has been a staple of the Western media, hence most people still regard the country as a volatile place to be avoided. However, most parts of the country have been stable for several years, and the country's transformation has been little short of astounding. Kampala is now the modern, bustling capital of a new Uganda, a country with one of the fastest growing economies in Africa. Uganda's beautiful mountains, trekking opportunities and mountain gorillas attract travellers. Before independence, Uganda was a prosperous and cohesive country. Its great beauty led Winston Churchill to refer to it as the 'Pearl of Africa'. Archeology tells that prehistoric man walked Earth in what is now Uganda, and many sites have been excavated that show habitation over the centuries. One of the more recent excavations is in Kiboro, near Lake Albert, where there are found traces of village life going back thousands of years. 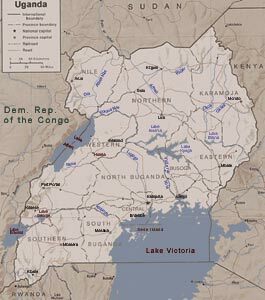 Around A.D. 1100, Bantu-speaking people migrated into the area that is now Uganda, and by the 14th century they had been organized into several independent kingdoms. The most powerful of these were Bunyoro (16th-17th century) and later Buganda (18th-19th century). In 1962 Uganda gained independence under a federal constitution that gave Buganda a large measure of autonomy. There are four ethnic groups thriving in Uganda: Bantu (the most numerous), Cushites, Hamites and Madi (Central Sudanic). The majority of the population is dependent on agricultural harvests in the fertile area south of Lake Kyoga. The contrasts between the various peoples of Uganda reflect the multiplicity of its culture, traditions, and lifestyles. Uganda has been created by the union of many peoples, ancient peoples with their own traditional lands, their own customs and a way of life inherited from their ancestors. This has made it acquire a cultural diversity, especially in music and dance. The earliest people surviving in Uganda are the pygmaean: the Batwa and the Bambuti in the Rwenzori Mountain range. They live on hunting and gathering. They are ethnically related to the pygmies of the Congo, the Ndorobo of Kenya and the Khoi-San or San people (Bushman and Hottentots) of South Africa. Their language is called Kumbuti. - The Ugandan bushmen (Bakonzo - Bantu) are small people, short and dark skinned. These form the original population of the mountainous areas and forests. Their natural surrounding gave them a rich variation in small percussion instruments, wooden horns and other small portable instruments and simple dances. The musical point of view of the bushmen had a significant influence on the general population of Uganda. - The hunter-gatherers - the people who have inhabited the longest, and who might thus be called aboriginal or indigenous people (a somewhat pointless term, really, given that every human society on earth has migrated at some point of time in its history), were various small groups of hunter-gatherers who lived in scattered groups throughout the country, though mainly in forests (most of which have been felled over the last century). They relied on hunting, bee-keeping for honey, and the collection of wild fruits and vegetables, although some also practised limited agriculture, which is believed to have begun as early as 3000 years ago. Most of these hunting-gathering cultures have now all but disappeared, having been either annihilated or assimilated. - The Cushites - of the major ethno-linguistic groups, the first to arrive were the Cushites, the first of whom (ancestors of the present-day Somali, Rendille and Wa-Boni) are believed to have entered north around 2000-1000 BC from Ethiopia. Some sources quote a figure of 9000 BC for this, although it appears that they were confused with the hunter-gatherers. It is needless to say, that there is little evidence linking any particular ethno-linguistic group to any archaeological finds dating from that time. Many subsequent migrations have since occurred, the latest in the mid-1900s, so that tracing the ancestry of any of these peoples is a confusing and probably pointless exercise. - The Hamites were tall, athletic and light skinned people. They originally came from the northern areas of Africa trekking with gigantic herds of cattle. Their sets of instruments were limited, and these included flutes, small horns and small portable string instruments. Their musical influence spread easily due to their trekking which brought them in contact with many different cultures. This led to the creation of several instruments in Uganda that are said to have come from the Arab world. The 1969 census numbered the Asian population in Uganda at about 70,000. Asians were officially considered foreigners despite the fact that more than 50 per cent of them had been born in Uganda. By the 1970s South Asians had gained control of the retail and wholesale trade, cotton ginning, coffee and sugar processing, and other segments of commerce. President Amin deported about 70,000 Asians in 1972, and only a few returned to Uganda in the 1980s to claim compensation for their expropriated land, buildings, factories, and estates. In 1989 the Asian population in Uganda was estimated at only about 10,000.